Government Personnel Mutual Life Insurance Company or otherwise known simply as GPM Life, was founded in 1934. This was a time when the United States found itself between the two major world wars and WWI had left a lot of families simply devastated. It was then that Peter J. Hennessey, a retired Army Colonel realized that all the life insurance policies during that time seemed to exclude paying kind of benefits if the one insured had been killed during an act of war. Those who thought they were doing the right thing by buying life insurance then found themselves without any benefits if they had a loved one who had been killed during WWI. Peter Hennessey then went around to various different insurance companies with his idea of getting rid of this war exclusion. None of them agreed with him that this was important. This is what helped him decide to start up a new type of insurance company and one that would provide insurance protection even if someone died during a war. So, in 1934, he founded Government Personnel Mutual Life Insurance Company which became the first one to serve the needs of military personnel and their families. Just four short years later, Colonel Hennessey died very unexpectedly and his wife Blanche Hennessey was elected to be the president of the company. This was yet another first in insurance history, a woman leading a commercial insurance company. Over the past 80 years, GPM has expanded their market to include all Federal employees, families, individuals, and seniors. Their services and products are unique and each is specially designed for all these different markets. GPM Life Insurance company has been given an A- or Excellent rating by A.M Best’s opinion in the company’s excellent ability to be able to always meet their ongoing insurance obligations for their clients. This latest rating was given to them in February of 2017. These ratings have been provided by A.M. Best on Government Personnel Mutual Life Insurance Company since1954. Ever since GPM Life was founded in 1934, they have operated under a consistent philosophy, and that is to maintain a long-term view of things. This means the company is managed in a way that ensures it will be viable and relevant today and in the future. They are an insurance company that is recognized all over the country as a mutual company that is owned by its policyholders. They don’t report to nor do they share the profits with the shareholders. It’s the policyholders who share in the profits through their policy dividends and they also elect who is on the Board of Directors and they are the ones that oversee managing the company. This means that GPM Life is totally accountable to their customers and the strength of their financial statements shows their commitment to this cause. It’s important to GPM Life that their policyholders understand Medicare and the maze that exists to try to get through in order to get the right coverage. They provide important information to help educate folks on the ins and outs of Medicare and Medicare Supplement insurance. Here is a little about Plans F, G, and N that GPM Life offers to its policyholders. Plans F and G are the most popular plans currently. 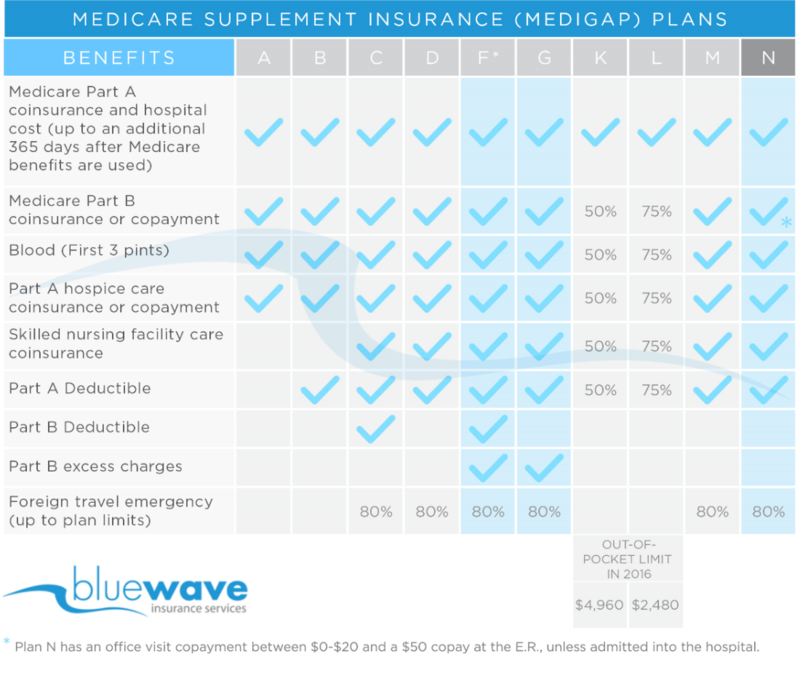 As you can see in the chart above, Plan F covers 100% of all costs that Medicare does not pay in full. Plan G is identical to Plan F, the only difference is that the annual Part B deductible is not covered. In 2019 this deductible is $185 for the year. Overall Plan G is a much better option vs Plan F.
As for Plan N, it covers the basics covered with F and G however, it does not cover Part B deductible or Part B excess charges. Also, there is a copay of $0-$20 per office visit with this plan. Plan N is the least expensive supplement plan of the three. You can read more about Plan N here. GPM Life is an established insurance company with a strong, stable history. We do recommend them in markets where they are competitive on price. Before applying for a plan be sure you have compared rates from all the carriers in your area to be sure you are not overpaying. Call us direct at (800) 208-4974 for a free quote comparison today!